Bellevue is nestled in the southwest corner of Omaha, right next to the Nebraska and Iowa state line, which is directly to the east. To the south of Bellevue, you’ll find La Platte and, get this, the Platte River. To the west exists La Vista, Richfield, Springfield, Gretna, and beyond. To the northwest you can also find Manawa State Park, Fox Run Golf Course, and the Fontenelle Forest Nature Center. Why are we giving you a geography lesson? You are sitting there in need of domestic appliance repair in Bellevue, NE, and you are looking for answers. The short answer is that you are right. If you are looking for same-day service on all name brands on major and small appliances, Andy’s Appliance Repair & Parts House has you covered with unmatched experience and a commitment to customer service that you won’t find in Bellevue, Lincoln, Council Bluffs, Omaha, or beyond. The long answer will, as you can guess, take more time. Keep reading to find out more about what we can do for our Bellevue residents looking for kitchen appliance repair. Since 1971, we’ve been providing folks in our Nebraska community (and our Iowa neighbors who are relatively close to the state line) with a higher standard of appliance repair. You’ve probably heard us say it already, but the point remains; having close to a half-century of experience in the same community counts for something. It shows that we have developed a word-of-mouth reputation throughout the years. You don’t stay in business throughout multiple generations by cutting corners with your work or by treating others ways in which you wouldn’t want to be treated. We don’t think our 45 years of experience is any kind of coincidence. We believe it has to do with our credibility; we treat every house call, big or small, with the same care that we would want our own families to be treated with. That difference comes through in a variety of ways. With the biggest parts house in the region, we have factory-certified technicians with a wealth of experience in determining the correct part for the job. Couple that know-how with a laptop uploaded with the most recent updates in factory-certified appliance parts, and you are sure to have the correct part needed for the appliance in question. If there is an exception to the norm and we don’t have the part in our service van or at our local parts house, we can immediately order the part from your home so that it can arrive within one or two business days. Typically, we will be able to solve all problems on the spot. If we need to wait for the correct part to come, you can expect the entire problem to be resolved within 48 hours in almost every circumstance. Of course, outlying circumstances arise, so we don’t want to make any promises besides our commitment to doing everything in our power to get your appliance fixed and your life’s normal day-to-day back in order. That glowing testimonial leads us to our next point; what you can expect when Andy’s comes to pay you a visit. 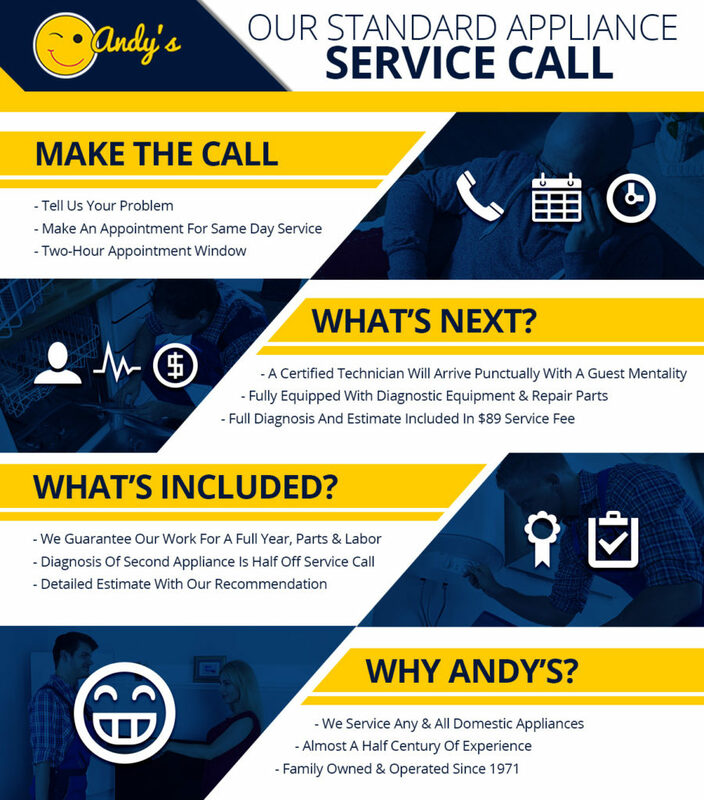 As the above infographic indicates, we have a unique approach to appliance service. We provide same day service in almost every circumstance, and are generally able to solve whatever issue you have on the spot, once the diagnosis and estimate take place. Our master certified appliance technicians will wear booties to make sure we don’t track in any unwanted dirt or dust along with us while we are in your home. We also will make sure to not ring your doorbell, just in case any little ones have gone down for a midday nap! Once we are in your home and taking a look at the problem, we make a point to operate with a “guest mentality” throughout our time with you. That means making sure we arrive on time and behave mindfully when we are in your home. Hey, we get it; it’s not super fun to have a stranger in your home in the middle of the day. But we do our best to get the job done well while not causing you any extra headaches. What’s more, all of our technicians use Appliance Job Rate Pricing that is specifically oriented to the Nebraska region. This way, you can have an added assurance knowing that your technician has fairly priced out your job. We’ve found that our absolute dedication to providing a higher level of customer service leaves our customers happy. At the end of the day, that’s the most important thing! If we can fix your fridge and bring a smile to your face in the same service call, then we are doing our job. Like we mentioned above, we provide affordable appliance repair for all small and major appliances: refrigerators, washers, dryers, ovens, stoves, dishwashers, built-in coffee makers, ice makers, freezers, warming drawer cabinets; we can handle it all. We are going to highlight a few of the more common repair types we encounter today, but keep in mind we service pretty much any kind of issue you might have, irrespective of appliance brand, age, size, or type! If you are looking for refrigerator repair in Bellevue, you might have found this page or one like it by typing into your smartphone something to the effects of “fridge repair near me” or “local appliance repair company”. Regardless of how you got here, the important thing for you know is that we can service your broken refrigerator in Bellevue. We are factory certified to perform both warranty and non-warranty repairs on all refrigerator brands. We only use factory OEM original parts to keep your machine running safely and up to par with OEM specifications. While other appliance repair companies might not make this promise (or at least they won’t volunteer this information), we want to be as upfront about it with our customers as possible. If it can give you a bit more peace of mind, it’s worth it. We would also like to highlight our dishwasher repair service in Bellevue, NE. A broken dishwasher is no fun, although it’s typically not quite as much of a headache as a non-functional refrigerator proves to be. For one, you don’t store your milk, fruits, or vegetables in your dishwasher. Well, maybe you do. And if so, more power to you! But generally speaking, dishwashers are used for washing dishes. While we probably aren’t going to be able to diagnose the issue over the phone (nor should we attempt to do so), we can let you know when we are going to make it out there to fix your dishwasher. Once we are there and have diagnosed the issue in hopefully just a few short minutes, we will do our best to provide you with a thorough description of what goes into the estimate we provide you with. We want to make sure You feel completely comfortable with our recommendation, but ultimately the buck stops with you. We make a point to be as communicative as possible throughout the entire dishwasher repair process. If we happen to need a part that will take a day or two to get to us, we will keep you updated and informed regarding any progress on that situation. Our priority is to get your issue handled with as much speed and precision as possible. If you’ve come to this site and page looking for stove repair in Bellevue, we’ve got you covered with same day service and a commitment to solving your problems. Handling questions revolving around the repair vs. replace dilemma is one of the things we do well. More often than not, we’re able to throw our two cents in when we are asked about the best direction to take. Sure, nobody likes to spend a few hundred dollars on an unexpected expense. But people really don’t like spending thousands on a new stove, oven, cooktop, range, or whatever you might call it. We can provide you with factory-certified repairs and OEM original parts to help make sure that day doesn’t come for a while. Hopefully it’s a long while. We make a point to make sure that all knowledge our technicians possess is shared knowledge. This means that if an older, wiser factory-certified master technician is working with a younger technician, they will talk about past experiences and best practices to handle abnormal situations. For the customer, this means you get a well-prepared technician who might have the same amount of knowledge as ten other technicians combined. That is, if those ten technicians weren’t Andy’s Appliance Repair employees. Ovens breaking are never fun. They are especially un-fun when the holidays are right around the corner and the in-laws are coming into town. They will be expecting pies, casseroles, cakes, and other baked goods. If the unthinkable happens, we’ve got you covered. We are Bellevue’s choice for oven service and spare oven parts on brands like Wolf, Dacor, Frigidaire, KitchenAid, and many more. It doesn’t matter how old or new your oven is, either. Remember that our technicians carry laptops with the most up-to-date information on your particular unit. We are equipped to solve your problem with expert oven repair on brands that include but are not limited to the following. If you’ve got a washing machine that’s acting up, it’s your best bet to call in the professionals. Even if you are a handyman or woman, there are a lot of things that can go wrong, and unless you have experience with wiring and appliance repairs, you don’t want to make things worse for yourself or the washing machine. People of Bellevue know Andy’s Appliance Repair as the Bellevue washing machine repair experts of choice because of our online reputation, our word-of-mouth reputation, and our expertise when it comes to doing our job. Whether you are in Omaha, La Vista, Bellevue, or Council Bluffs, we can get your washing machine fixed in a hurry. Remember that we guarantee all work we do for a full year. That includes both the replacement parts and the repair work, mind you. So if you aren’t able to wash your clothes or you can but have to deal with a leaky machine, give Andy’s Appliance Repair & Parts House a call. We would love to provide you with affordable washing machine service in Bellevue and beyond. Since 1971, we’ve been setting the standard for appliance repair in Omaha, Bellevue, Lincoln, and beyond. One of the things that people turn to us for most is our affordable ice machine repair in Bellevue and elsewhere. Give us a call if your ice maker goes down, we will be out to you on that same day or the next! The final appliance we would like to highlight is the freezer and our ability to repair yours. Whether you have a fridge/freezer combo unit or you have a stand-alone freezer, we can provide you with quality freezer repair in Bellevue NE. Once we get your freezer problem fixed for an affordable rate, you’ll be able to rest easy with our industry-leading one-year parts and labor guarantee for all of the work we do. Let the freezing commence! Schedule your repair online today. We would love to be able to show you why so many folks of Bellevue go from first-time customers to life-long clients. Give us a ring or schedule your Bellevue appliance service appointment online today.